Baby bathtubs are not really anything I ever gave much thought to. Originally we didn't buy one at all, thinking we could bathe the little 6 lb. chicken in the sink (isn't that what our parents did with us?). But after realizing that the bathroom sink was too small and the kitchen sink, which was perfectly sized, was always filled with dirty dishes, we decided we should buy one. 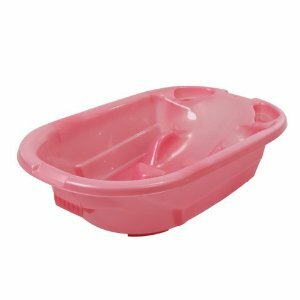 So we saw a cheap, hard plastic baby bath on the sidewalk in front of one of those dingy housewares shops on Agrippas and bought it. It was the equivalent of less than $10. I know Menachem immediately hated it. The tub had no legs so we'd place it in our regular bathtub and the person washing the baby would have to bend down--not a big deal when you have a big kid who can support herself, but very hard on the back when you're clutching an infant with both hands and trying to wash her, all while sitting on your knees on the cold bathroom floor. (And the taller you are, the more you have to bend over the side of the tub.) Sometimes we'd bring it out to the dining room table, but that meant shlepping lots of water back and forth to fill it (and then empty it) or shlepping a very heavy water-filled tub. It was messy and annoying. 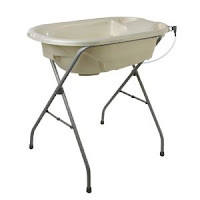 I think next time around, Menachem would probably want us to get something like the Dream On Me Baby Bather and stand (preferably one with a drain and hose so you can just drain it straight into the tub or sink). But I would argue...where are we going to store that monster? 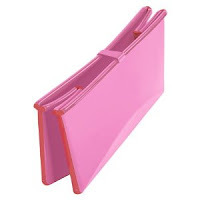 Some fold up (I'm not sure if this one does), so I suppose that would work. 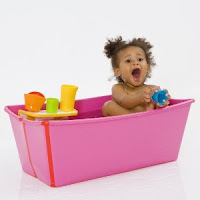 Alternatively, I say spend three months on your knees and get this adorable, easy-to-store Flexibath. I'm not sure we'd really bring it traveling with us, but it seems perfect for apartment living. It has a drain, so you don't need to dump out a heavy tub. It's wider than other tubs and supposedly can fit 2 toddlers! It would probably be cramped, but it does make me think that maybe we should put Hila back in her baby tub -- I know she'd fit comfortably and filling that instead of the big tub would really save water. There's a non-slip surface. Ours doesn't have that and gets really slippery. I'm wondering if you need to let it dry completely before you fold it up. Otherwise, would it maybe get moldy? Then there's the bath/changing table combo option, which Bethami can tell you about.